Canada’s language diversity—that is, the use of languages other than English and French—is mainly affected by its Aboriginal and immigrant populations. Increasingly, Canadians have non-official mother tongues and speak non-official languages in the home. From 2001 to 2006, almost 20% more people reported speaking a non-official language in the home1. 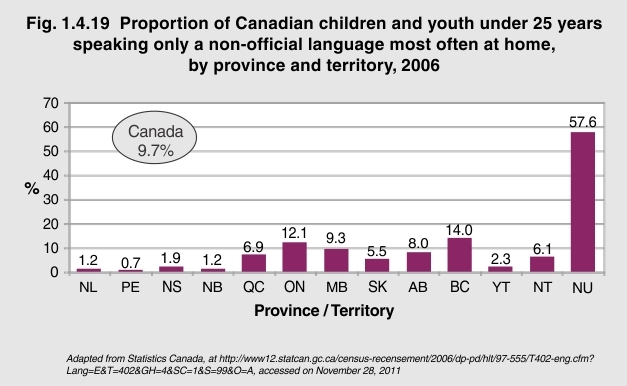 The proportion of children and youth who speak only a non-official language in the home varies greatly by province and territory. In Nunavut, 58% of children and youth under 25 years speak a language other than English and French at home. That proportion is 14% in British Columbia, 12% in Ontario and 9% in Manitoba. Language is the heartbeat of a culture. When a culture’s language is endangered, so are its stories, literature, songs, traditions and discourse. Most notably in Canada, the Quebecois have been battling English Canada for the protection and distinction of the French language and the Quebecois culture. In response, Canada’s official languages are French and English, which mandates that the federal government conduct its business in both official languages and provide government services in both languages. This includes encouraging provincial, territorial, and municipal governments to conduct themselves and to provide services in both English and French. The province of Quebec is officially French unilingual and is not required to provide services in English. The government provides grants and contributions to groups representing French-speaking minorities in the other provinces to assist with the establishment of an infrastructure of cultural support and services1.